A team of McMaster Chefs consisting of Paul Hoag, Lincoln Crowe, John Barreda and manager Catherine Young have won the Grand Prize and Gold Medal and a Gold medal for Best Dessert at the Canadian College and University Food Service Association (CCUFSA) Culinary Competition in Toronto. The theme of the competition was connecting culture with flavour using ingredients found within a 100-mile radius of Toronto for the purpose of reflecting the cultural diversity of Toronto. Each team was asked to design and prepare a three-course meal using certain designated products. After the judging takes place the dinner is then served to 200 conference attendees. 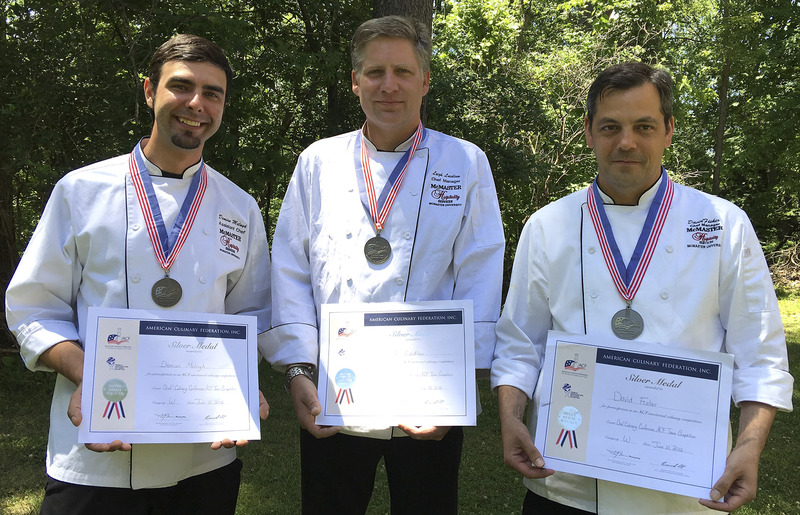 Additionally, McMaster Hospitality Services Chefs David Fisher, Leigh Laidlaw and Demian Melnyk received silver medals at the American Culinary Federation. The multi-day competition is a highly regarded skill-based event represented by some of the top level University culinary teams from across North America.